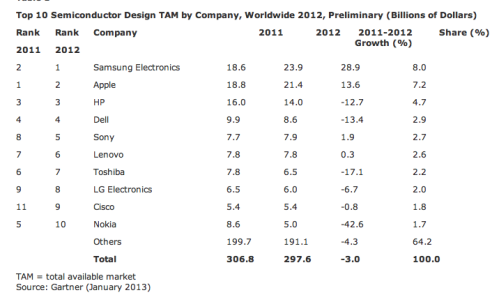 Semiconductor demand was obviously dominated by Apple and Samsung last year; the only question is which ranks No. 1 for 2012, as previous reports showed that Apple had dominated demand. As for last year, Gartner has the numbers. Based on analysis of the total available market (TAM), the South Korean manufacturer and Apple together consumed $45.3 billion semiconductors in 2012, and they represent a combined 15% of total semiconductor demand, while the market decreased by 3% overall. The top ten companies with the highest semiconductor demand are Samsung Electronics, Apple, HP, Dell, Sony, Lenovo, Toshiba, LG Electronics, Cisco and Nokia, with Samsung surpassing Apple in 2012 in terms of semiconductor demand. As the Gartner study points out, semiconductor demand has dropped in the PC market, but the growth of new mobile computing devices such as smartphones and tablets couldn’t fully compensate for this.